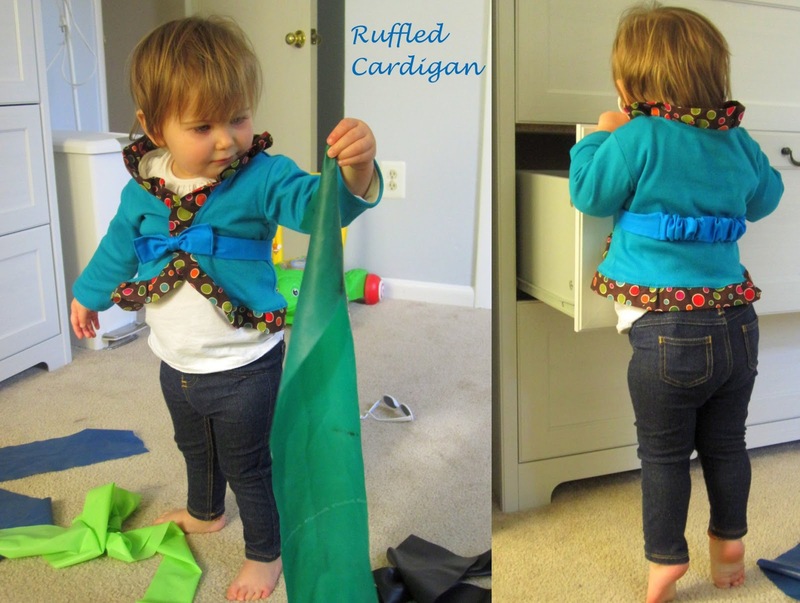 For Christmas Eve eve (yes, the night before Christmas eve hehe), I made Bean a Ruffled Cardigan from Blank Slate Patterns. We had a family dinner to go to and I wanted something a little dressy, but cute and toned down a little when worn with jeggings. I had tested the pattern so I knew it was a great shape and would give me exactly what I was looking for. This pattern is meant for knits, but it sews up so simply that even if you’re scared of knits you should give it a try. It is so basic that I consider it a good beginner pattern. Especially since the pattern calls for pre-ruffled ruffles so you could easily buy some ruffles instead of making your own. I wanted to make my own ruffle so I could use a cute quilting cotton with a fun pattern to match, but either way once the ruffle is done the rest is easy easy. The pattern calls for a ribbon to be tied around the waist to sort of hold the front sides together, but I thought it’d work better to use a belted bow so Bean couldn’t easily remove it. I have a quick tutorial for making the belted bow coming later this week so check back if you’re interested. The cardigan worked great for the dinner and she’s worn it a bunch since then too. It’s a little snug now since I made it in the 18 month size and she’s now into size 2T, but I think it’s still cute. It’s really easy to make this completely reversible too. The pink side looks just as great as the ecru side. I made the sleeve edge of the pink side stick out a tiny bit longer so it looks like a nice contrasting band along the ecru sleeve edges. I wanted to make another cardigan, but make the sleeves shorter and use the length of the 18 month size so it would come up a little higher than the size 2T would right now on Bean. It should be a great layer as the days start warming up. This time I made a button hole on one of the front edges so the cardigan could be buttoned. I also made a belted bow to match, so that’s a fun option that works even over the button. Below you can see how the new cardigan I made is meant to be a little short. It looks so sassy. Although maybe that’s the sunglasses making her look sassy hehe. 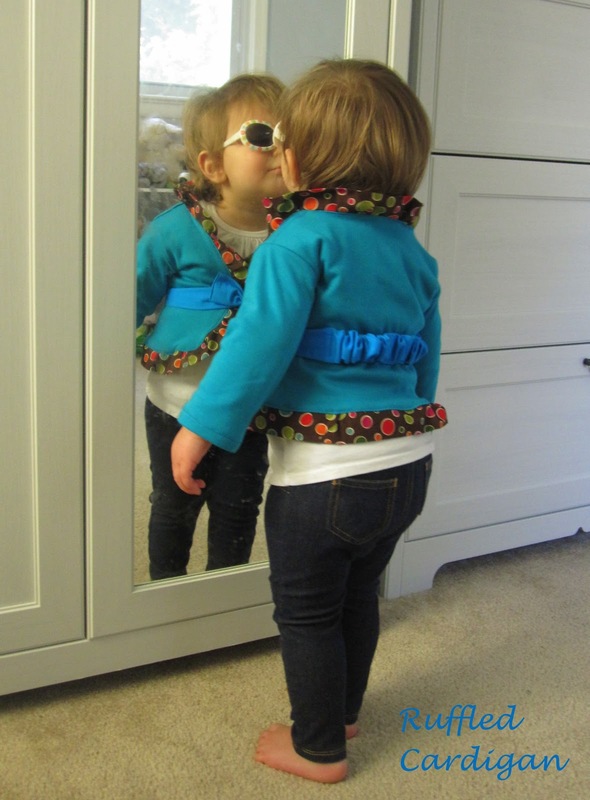 By the way, in case anyone is wondering why Bean’s mirror is excessively smudgy…..
Oh my…cute cardigans for such a little cutie! She's adorable…as are those cardigans. Great job! The sunglasses perfect the look! Another great pattern and sew up! That pink one -soooo cute! This is getting featured next time I do a features post. She's so precious,and I absolutely love the belt you added! Nice touch! 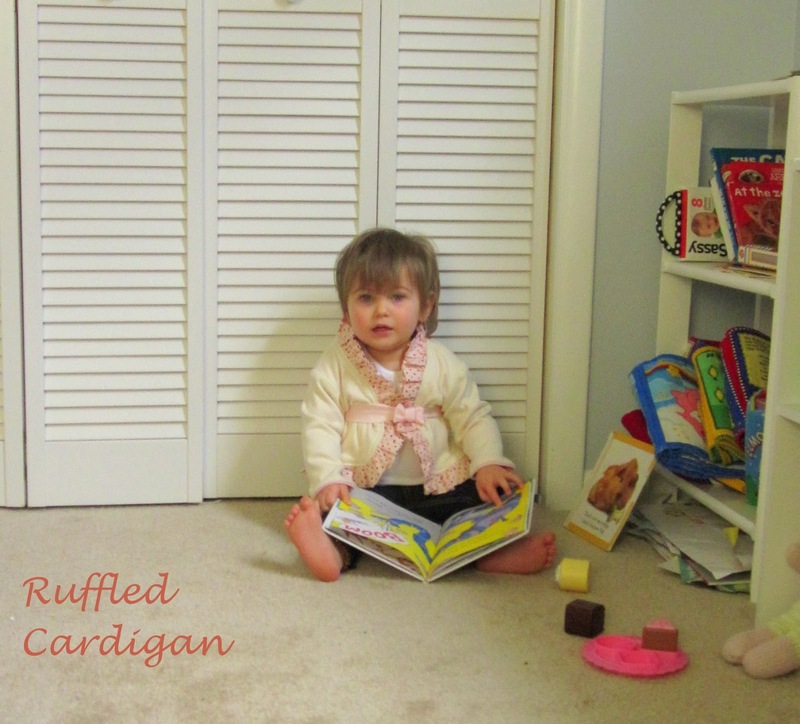 Awww….I love the ruffled edge on this sweater! Such a sweet detail. I really love it with the jeggings, she looks adorable. Oh my word, how cute is this? It looks way too hard for me to make, but I would love to learn how. 🙂 Your little girl is definitely feeling stylish, lol. Love those pics! How sweet! 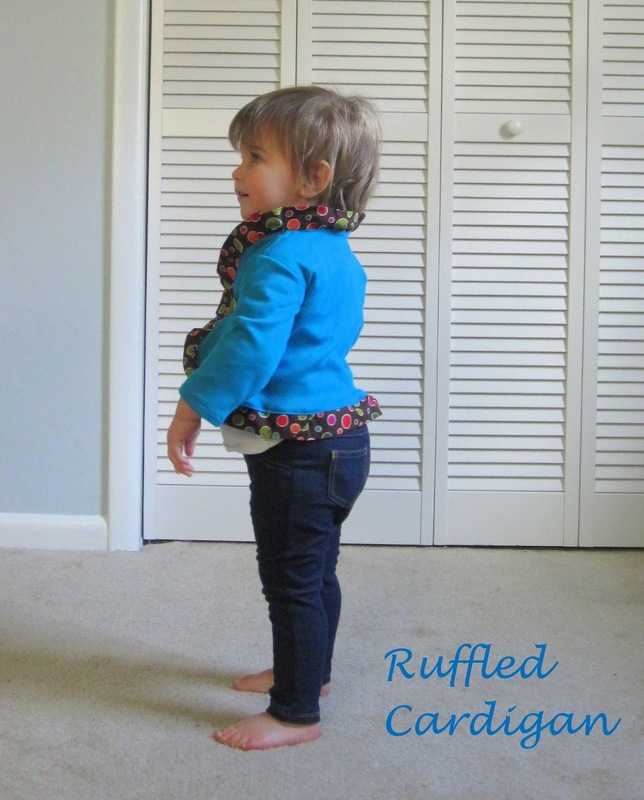 The cardigans turned out great, and you couldn't ask for a cuter "model", she's adorable! 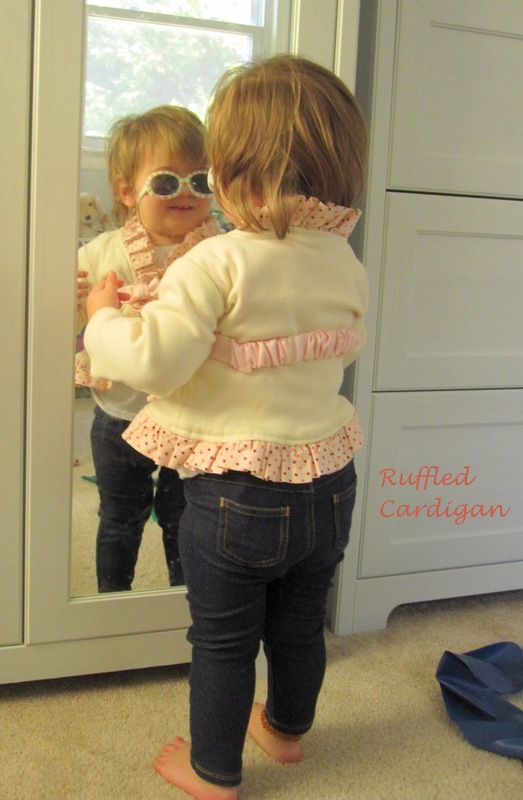 Your cardis are great and your model is a cutie pie… adorable! oh, and I love Melly's pattern too! This is so cute. We have a link party called Wednesdays Adorned From Above Blog Hop and would love to have you share this and any other posts with everyone. It runs from Tuesday night through midnight Sunday. We also have a $50.00 Visa Gift Card Giveaway. Here is the link to the party. How cute, and what an adorable little model! Both cardigans are really cute! I'm pinning these! They are adorable. I can't decide which is my fav of the two. I like the soft pink one, but that blue is sassy! Thanks for sharing @ Submarine Sunday! Just adorable………Thank you for sharing with the Clever Chicks Blog Hop this week; I hope you’ll join us again!